France's top military official said on Thursday his forces were prepared to carry out strikes on Syrian targets if chemical weapons were used in an expected government offensive to retake the northern province of Idlib. Russia, an ally of President Bashar al-Assad, resumed air strikes against insurgents in Idlib on Tuesday after weeks of bombardment and shelling by pro-government Syrian forces in an apparent prelude to a full-scale offensive against the last major enclave held be rebels. 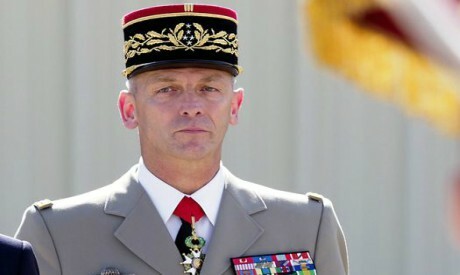 "We are ready to strike if chemical weapons were used again," Armed Forces Chief Francois Lecointre told a small group of reporters. "They can be carried out at national level but it's in our interest to do it with as many partners as possible." In April, France, the United States and Britain launched more than 100 missiles at pro-government targets in retaliation for a suspected poison gas attack. The prospect of an offensive on Idlib alarms aid agencies. The United Nations has said about half of the 3 million people living in rebel-held areas of the northwest have already been displaced. It estimates some 10,000 jihadists are in the area. Lecointre said he expected the final pockets of Islamic State group resistance in Syria and Iraq to be defeated by the end of November. Idlib's fate now appears likely to rest on a summit on Friday in Tehran between the leaders of Russia, Turkey and Iran - a meeting that Russian deputy foreign minister Sergei Ryabkov said would make the situation "clearer". While the United States and its allies have warned of a blood bath, they have made clear they would only intervene should they deem that chemical weapons have been used. A French military source said the indications were that Russia and its allies wanted to wrap up the Idlib offensive by the end of the year. The source said Paris believed the United States would maintain its military presence in Kurdish-controlled northwestern regions of Syria given that Washington wanted to limit Iran's influence in Syria.